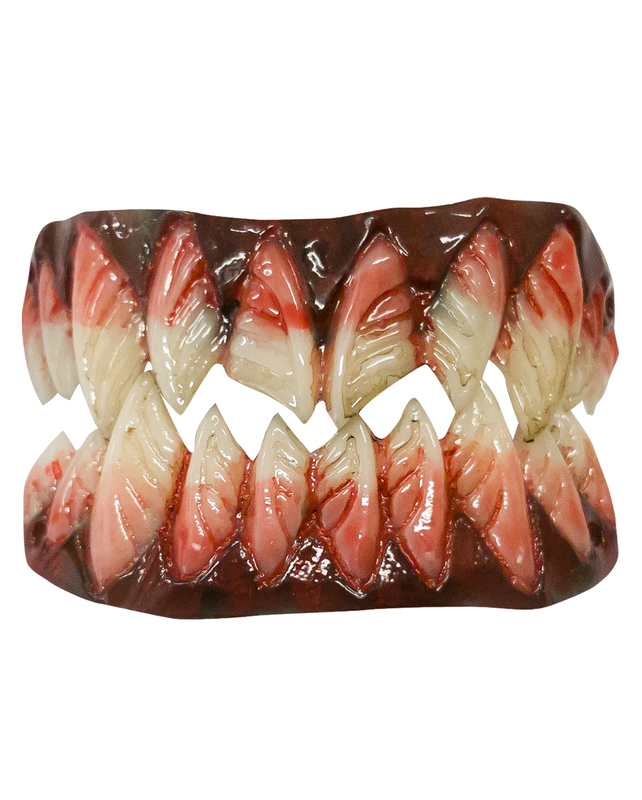 Dental FX Veneers Bloody Klingon Teeth in film studio quality at an affordable price. The blatant looking monster teeth can be found among horror fans and zombie actors alike. With the ultra-flat toothpieces you have impressive teeth for your bloody beast costume at the next Halloween party. Dental FX Veneers Bloody Klingon Teeth are hand-painted, thin dental veneers made of high-quality dental acrylic that are attached to your own teeth using reusable thermoplastic adhesive beads. Dental FX Veneers Bloody Klingon Teeth are professionally manufactured and have been used in the film industry for years. The resulting special make-up effects have been so successful that they have already been used for well-known film productions such as Resident Evil, Dance of the Dead, The Take and many other Hollywood film productions. The Dental FX Veneers Bloody Klingon Teeth can be perfectly adapted to your mouth and can be inserted & removed again and again without any problems. We will of course send you a German manual for inserting the Dental FX Veneers Bloody Klingon Teeth. Attention: Dental FX veneers are not dentures and are made for temporary use. Do not eat with Dental FX veneers in your mouth, nor wear them to sleep. There is danger of suffocation! Do not use on braces, crowns or dentures. Do not use thermoplastic adhesive beads for hypersensitivity to polycaprolactone. Not suitable for children, Dental FX veneers are not a toy!